SICKER by Christa: Released Today! Please help me to congratulate my friend Christa Wojo on the release of Part Two of her Psychological Suspense Series. SICKER is now available on Amazon Kindle. Review coming soon. “How did John Branch get so sick? Part II of the gruesome psychological suspense series continues from the mind of John Branch. John Branch’s sickness has dominated the lives of all those around him, consuming all it can from well-intentioned doctors, compassionate strangers, and trusting loved ones. His chronic illness also bonds him intimately to his wife Susan, trapping them in relationship of unhealthy psychological attachment. 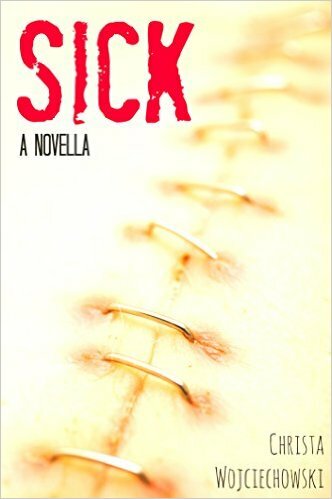 You may remember the review I wrote last year on Christa Wojo’s debut psychological suspense horror series SICK. In Book One, we peered into the life of Susan Branch, a woman struggling to take care of a very sick husband with a number of diseases plaguing his body. Well, I am happy to inform you that part two, SICKER is now available for pre-order! So, I am not ill but I did just preorder SICKER. The ending of SICK was so sick I cannot wait to continue reading. Click the book cover below to pre-order SICKER and welcome to the mind of John Branch. “SICK” is a psychological suspense novella surrounding a woman with a very sick husband who lives in a constant vacuum of life-threatening illnesses. The offspring of wealthy parents, John and Susan Branch married and settled into an affluent life that eventually dwindled after John took over his family business upon the death of his father. Soon, the family business plummeted and so did John’s health. Diagnosed with Idiopathic Thrombocytopenic Purpura, a complicated blood disorder, Susan is forced to take care of her ailing husband while trying to maintain a livelihood of basic necessity as a full-time medical clerk of a podiatrist. Immediately it is apparent that John’s illness is taking its toll on Susan who from the onset appears to neglect part of herself to be his full-time nurse. As the story moves along, I started to notice something very unusual about John. His wife reads him books as he drifts off to sleep, feeds him baby food, sings him lullabies, and says that he’s a “Good boy”. If that’s not weird enough, John pouts, throws temper tantrums and whines like a three-year-old. I became annoyed at Susan’s inability to see the signs and felt sympathy for her sense of low self-worth. Eventually, I began to associate John’s behavior and his speech with that of mental retardation; surely this man couldn’t be serious. And as Suzie slaved to be his mother, wife, and nurse, I could not be prepared for the story’s ending. John, the progeny of old money, an Ivy League education, and a keen intelligence behind his eyes was far from a learning disorder. John Branch, the world’s most sick man, would turn out to be far sicker than I could have anticipated. As I read this book I knew I wanted to give the author a four-star rating, but then I got to the end and it blew my mind so I had to upgrade her! I love the psychology of the story. How the persona and personal background of Susan and John helped me as a reader and as a person understand the outcome of this sad situation. There are people in this world who grow up with silver spoons in their mouths and yet they have no love. Whether that is self-love or love that wasn’t given to them as children, a lack of love can transform a mentally stable individual into a monster. At the conclusion of the read, the author provides some very informative and educational information about one of the world’s least talked about conditions which I won’t mention here as I think that will give away the story. In any event, SICK is a must read. Be sure to follow Christa on all of her social networks and to grab your copy of SICK today. Yes, like right now.